When Politico first reported on the CBC PAC’s Feb. 11 decision to table a discussion regarding an endorsement for Maryland Senate candidate, Rep. Donna Edwards, many were perplexed and the backlash was swift. The Color of Change launched a petition titled, ‘Black Power or Corporate Power?’ while The New Republic wondered if the CBC had lost its conscious. If elected, Rep. Edwards, an outspoken progressive firebrand currently representing Maryland’s 4th district, would only be the second black woman to serve in Senate. Edwards’ rival in the Democratic primary, Rep. Chris Van Hollen has vastly out-raised and out-spent her. At the end of last year Van Hollen had raked in $3.6 million compared to Edwards’ $300,000. When the CBC PAC announced their decision, Edwards and Van Hollen were polling at an essential tie, leaving some to wonder why the CBC PAC had decided to abandon her in the midst of running a historic campaign against a politically-established white man with deep pockets. According to Politico’s initial report, CBC PAC board member and former Congressman Al Wynn raised the strongest objections to an Edwards endorsement. Apparently, Wynn felt her lack of endorsements among in-state black officials disqualified her from a CBC PAC endorsement. The Color of Change petition also backed up these claims. Rashad Robinson, executive director of the nonprofit civil rights group, wondered why Wynn was even allowed to participate in the discussion, considering he had lost his seat to Edwards in a 2008 Democratic primary. Wynn suffered a crushing defeat, only managing 35% of the vote in the district he had represented for 15 years. Edwards took 60% of the vote. After loosing his seat to Edwards, Wynn went on to lobby for Big Tobacco. According to the Color of Change petition, Wynn is not the only lobbyist on the CBC PAC board affiliated with companies that are harmful to the black community. 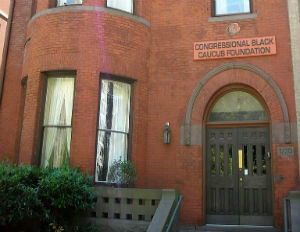 Of the 21 board members, only 8 are elected officials belonging to the Congressional Black Caucus. 11 of the board members are lobbyists, representing companies such as Lorillard Tobacco, the cigar industry, student-loan giant Navient, and the makers of the addictive opiod, OxyContin. Ben Branch, executive director of the PAC, told BE.com that board members only represent themselves, and do not advocate on behalf of their clients. Branch also noted that many of the board members are former staffers with close ties to the CBC (Branch is actually a former staffer for Al Wynn).